Easy PC audit, Mac, Linux and FreeBSD audit, reporting and software licenses management. No exhausting preparations are needed to get your PC audit up and running: just install program on one computer and that's it - you're good to go. In a few short minutes you'll own data on all your Windows, Mac OS X, Linux and FreeBSD computers and network devices. All the data is stored in a separate folder on your hard drive, where you'll find a small file for every network device you've scanned. 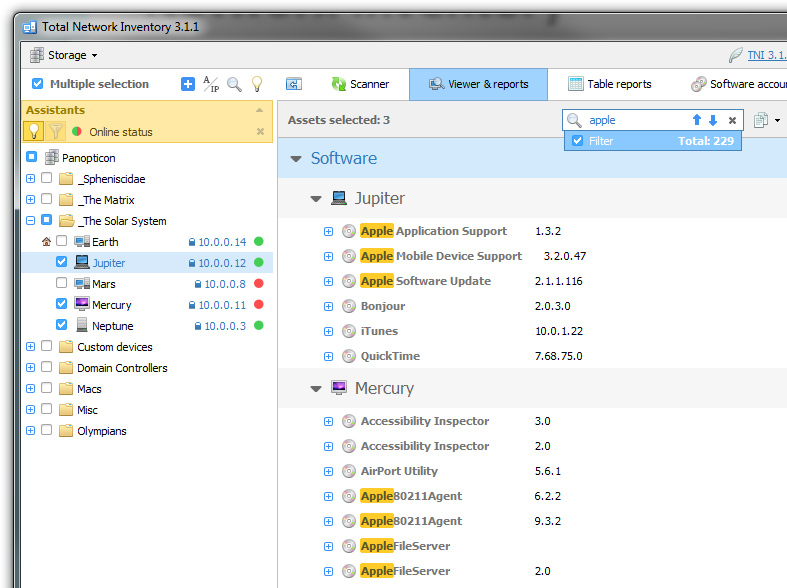 Group your computers, attach comments, inventory numbers or all kinds of other information to them. Hardware audit will show you all the software installed in your network: what version are present, what computers have them, how many copies are found and whether your licenses actually allow that many. License keys for some applications will be scanned automatically, and you're free to manually specify them for the rest. Top 4 Download periodically updates software information of PC Audit 3.1.6 full version from the publisher, but some information may be slightly out-of-date. Using warez version, crack, warez passwords, patches, serial numbers, registration codes, key generator, pirate key, keymaker or keygen for PC Audit 3.1.6 license key is illegal and prevent future development of PC Audit 3.1.6. Download links are directly from our mirrors or publisher's website, PC Audit 3.1.6 torrent files or shared files from free file sharing and free upload services, including Rapidshare, HellShare, HotFile, FileServe, MegaUpload, YouSendIt, SendSpace, DepositFiles, Letitbit, MailBigFile, DropSend, MediaMax, LeapFile, zUpload, MyOtherDrive, DivShare or MediaFire, are not allowed! Your computer will be at risk getting infected with spyware, adware, viruses, worms, trojan horses, dialers, etc while you are searching and browsing these illegal sites which distribute a so called keygen, key generator, pirate key, serial number, warez full version or crack for PC Audit 3.1.6 download. These infections might corrupt your computer installation or breach your privacy. A keygen or key generator might contain a trojan horse opening a backdoor on your computer. Hackers can use this backdoor to take control of your computer, copy data from your computer or to use your computer to distribute viruses and spam to other people.